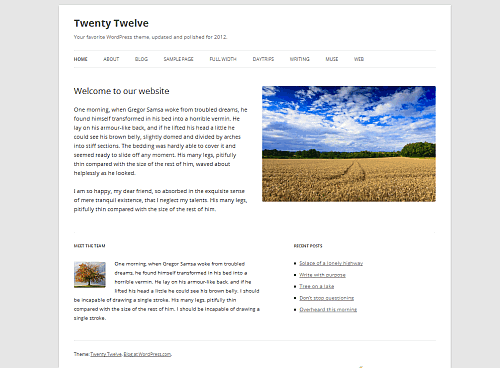 Want to download and install the next WordPress default theme called Twenty Twelve theme (2012 theme)? Right now the official default theme which comes preloaded with self hosted WordPress installation is the Twenty Eleven theme. But the 2012 theme is already out and available on WordPress.com (and now WordPress.org too!). This is the latest in the official default WordPress themes designed by the WordPress theme itself. Check out the live 2012 theme demo which is now available on WordPress.org self hosted installations. I think that this is much better than the 2010 and 2011 WordPress theme designs. After seeing the Twenty Twelve WordPress theme demo, you can really look forward to download 2012 WordPress theme as it is now available on WordPress.org. The new 2012 WordPress theme features a new homepage template which will allow you to load images, videos and selected homepage widgets to customise your front page. The highlight of the 2012 theme release is that it features a responsive web design, which will make your WordPress blog look great on smart phones, tablets as well as widescreen computers. A new open Sans font promises a great new look. In order to compete with the new blogging software, WordPress has realised that sometimes people just want to post content in the full width, with no sidebars – and now WordPress 2012 theme will allow you full width content with no sidebars as well. Pure content, no clutter. And of course post formats and their styling are more consistent. So if you have a WordPress.com blog, you can choose to install 2012 WordPress theme right now and check out its new features on your WordPress blog design. Update 30/9: Now download Twenty Twelve theme on WordPress.org. It will come preloaded by default in WordPress 3.5 soon for all blogs. Want to get quickly started with a WordPress blog, choose from these best managed WordPress hosting services.